How to Easily Master Format SAMSUNG GALAXY POCKET GT-S5300 & POCKET DUOS GT-S5302 with Safety Hard Reset? Information about how to fix problem at SAMSUNG GALAXY POCKET GT-S5300/GT-S5302. SAMSUNG GALAXY POCKET S5300 and SAMSUNG GALAXY POCKET DUOS S5302 is Android smartphone which is produce for entry level user who want to try Android. The specifications are quite good for standard usage such as phone call, sms, email, chat, internet browser or any other activity. The difference between SAMSUNG GALAXY POCKET GT-S5300 VS POCKET DUOS GT-S5302 is for the simcard slot. The SAMSUNG GALAXY POCKET GT-S5300 only have single sim card GSM, while SAMSUNG GALAXY POCKET DUOS GT-S5302 have dual card GSM slot, both for GSM&GSM. Fix and Problem Solving for Recovery SAMSUNG GALAXY POCKET GT-S5300 & POCKET DUOS GT-S5302 hang or not responding or malfunctions or stuck or freezing or bricked ? If we see the specifications of SAMSUNG GALAXY POCKET GT-S5300 & POCKET DUOS GT-S5302, then we should understand that this smartphone is not recommended to install a lot of applications from Google Play Store. Some applications maybe can not run good in SAMSUNG GALAXY POCKET GT-S5300 & POCKET DUOS GT-S5302 because they need more resources. If we’ve already installed that applications, then sometime it can make our smartphone become hang or stuck or bricks or frozen or the LCD touch screen become not responsive. The suggestion for fix this problem is try to find that application and uninstall it. After that try to soft reset or reboot SAMSUNG GALAXY POCKET GT-S5300 & POCKET DUOS GT-S5302. If the problem still happen, maybe you need to perform hard reset with master format. 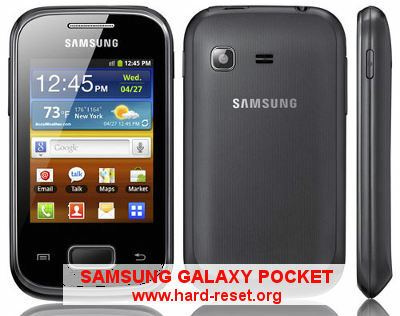 How to Soft Reset or Reboot or Restart SAMSUNG GALAXY POCKET GT-S5300 & POCKET DUOS GT-S5302 ? If you want to soft reset SAMSUNG GALAXY POCKET GT-S5300 & POCKET DUOS GT-S5302, try to remove the battery and then put again to the place then turn on the SAMSUNG GALAXY POCKET GT-S5300 & POCKET DUOS GT-S5302 to do reboot or soft reset. If you do not want to open the battery, you can do easily with pressing Power Button for several seconds and the option menu to turn off or reboot will appear. SAMSUNG GALAXY POCKET GT-S5300 & POCKET DUOS GT-S5302 will do the process to Master Reset to Factory Default, wait for several minutes. The SAMSUNG GALAXY POCKET GT-S5300 & POCKET DUOS GT-S5302 will doing the process of restoring to factory default. How to Restore and Reinstall Clean Android Operating system / firmware at SAMSUNG GALAXY POCKET GT-S5300 & POCKET DUOS GT-S5302 ? The source of operating system smartphone SAMSUNG GALAXY POCKET GT-S5300 & POCKET DUOS GT-S5302 has already saved in internal ROM. If some problem happen at SAMSUNG GALAXY POCKET GT-S5300 & POCKET DUOS GT-S5302 we can do reinstall or restore the clean and factory default operating system by doing hard reset with master format above. By doing the hard reset, than SAMSUNG GALAXY POCKET GT-S5300 & POCKET DUOS GT-S5302 operating system will be installing by itself. How to Unlock or Fix or Bypass or Solutions for SAMSUNG GALAXY POCKET GT-S5300 & POCKET DUOS GT-S5302 forgot password code or security lock screen pattern or pin? If we want to make SAMSUNG GALAXY POCKET GT-S5300 & POCKET DUOS GT-S5302 become more secure, then we can give security password pin or screen lock pattern. So if someone try to use your phone while you are away, that people should know the password or pattern. The situation become problem when we forget about the security password or screen lock pattern of SAMSUNG GALAXY POCKET GT-S5300 & POCKET DUOS GT-S5302. Do not worry because Google already prepare for this problem. Just try to find the Forget Password / Pattern button, the phone will ask for our Google account which already use and typed before. But if we also can not access the Google account, then the last option we should do by doing factory reset with hard reset step above. How to Improve Performance SAMSUNG GALAXY POCKET GT-S5300 & POCKET DUOS GT-S5302 to make run more faster? SAMSUNG GALAXY POCKET GT-S5300 & POCKET DUOS GT-S5302 specifications is not recommended for installing a lot of applications, the multitasking application also can make this smartphone become slowly or problem. To make it more faster, then you need to reduce the installed applications or you can try to do hard reset to make it become faster again. Is That Any Secret Code for Doing Format SAMSUNG GALAXY POCKET GT-S5300 & POCKET DUOS GT-S5302? The secret code for doing hard reset SAMSUNG GALAXY POCKET GT-S5300 & POCKET DUOS GT-S5302 is *2767*3855#. But please remember to always becareful typing that code, because the SAMSUNG GALAXY POCKET GT-S5300 & POCKET DUOS GT-S5302 will doing hard reset and remove all data and installed applications. Can I Upgrade Operating System SAMSUNG GALAXY POCKET GT-S5300 & POCKET DUOS GT-S5302 to ICS or Jelly Bean? AS far as we know when creating this information, Samsung still not create the official update for Ice Cream Sandwich and Jelly Bean operating system for SAMSUNG GALAXY POCKET GT-S5300 & POCKET DUOS GT-S5302, but if you want to try it, some people from XDA Developers already create the custom rom to upgrade SAMSUNG GALAXY POCKET GT-S5300 & POCKET DUOS GT-S5302. But that step is only for expert user, because some wrong step will make our smartphone corrupt and can not run properly again although we do hard reset. [A] Hi, perhaps your process to reformat is not finish or interrupted before the end steps. Therefore your phone become trouble. If you are understand what you will do then please read some resource about reflash using ODIN, but if you are not sure how to do that, then please consult with Samsung authorize service center. [A] Hi, unfortunatelly we can not give good answer for rooted or custom tweak Samsung Galaxy Pocket, because there are many non standard possibilities happen at your phone. Please consult with Samsung authorize service center. Maybe they can help to flash with official updated ROM for your Samsung Galaxy Pocket. The information from this page describe about samsung s5302 hard reset,how to format samsung duos,samsung gt s5302 hard reset,samsung galaxy s duos format code,samsung gt s5300 hard reset,samsung s5300 hard reset,how to reset samsung galaxy pocket,samsung gt-s5302 hard reset,s5302 hard reset,how to format samsung pocket. If you need another resource for hard reset, use search function at this homepage or find from our related posts. Hard Reset and Recovery Procedure for ACER LIQUID E2 (DUO) V370? How to Update ACER LIQUID E2? What is AcerCloud at ACER V370? How to Easily Master Format ALCATEL U5 with Safety Hard Reset? How to Easily Master Format OPPO A77 with Safety Hard Reset? Hi, if you forgot your Google account username and password to restore or unlock the forget security password / pattern at Samsung Galaxy Pocket GT-S5300, then you have to do hard reset with Option 2 above. Hi, please remember, to register or activate the Google account from Samsung Galaxy Pocket, your Internet connection should be active. You can use GSM data or Wifi data connection before activate that account. Hi, the slow response for your Samsung Galaxy Pocket usually happen because there are too many applications run in the background and it will make make RAM and processor resources insufficient. Although you are sure that only run little applications after reboot, but some background service will automatically work without need to start that apps like chatting Whatsapp, BBM, Line, WeChat, Skype and sometime like that. Facebook also will run in the background to wait for data update. Therefore, please try to reduce some not use applications and restart your phone. If you want to make your Samsung Galaxy Pocket performance run faster again like new, then you have to consider doing hard reset or master format. Hi, am using sumsang gt- s5300. I downloaded camera360 and it got crushed. When i try opening my camera it nothing is displayed and it becomes difficult to exit too. Hi, we are worry that the version of your downloaded application Camera 360 is not compatible with SAMSUNG GALAXY GT-S5300 or in some case that application crash with other installed one at your smartphone. Try to remove that application and do soft reset or reboot or restart. You can try other similar application Camera 360 like, and use it safely with your Samsung GALAXY POCKET GT-S5300. Hi. my mother`s Sam. Galaxy s5600 got crushed, there`s a screen on the LCD asking for the google account email and password. someone said it needed to be formatted. how can I do that? unavailable to dial or anything. Hi, if your Samsung using Android operating system, then easy to do hard reset like what wrote above. Please make sure what type of your Samsung (tell us with long full name will better), we will try to help if we can. Hi, If your Samsung Galaxy Pocket stack at Samsung booting Logo, first you need to try doing hard reset with hardware key above. If the problem still happen, maybe you ever try to do something like root or install other firmware. Please try to make sure you already flash the correct firmware or working custom rom. Hi, if you forgot the screen lock pattern security protection than you can try to press Forgot Pattern button, and you have to login with Google account username and password. If you can not access Google account, the last thing that you can do is doing hard reset or master format with hardware button. Thank you for this! I’m so happy that my phone is now ok. But still sad because all i install gone 🙁 … but the important thing is, its now ok. so, thank you very much! Hi. my samsung galaxy pocket became stock only at samsung logo it does not boot or load to the second logo and so on.please help me i need your help. Pls email me. Thanks. Hi, if the phone stuck in logo, we are worry the firmware is not install properly or you ever try to do something like root. If you can not boot up Samsung Galaxy Pocket, you may need to bring to Samsung service center for further check. my samsung galaxy needs upgrade from jellybin to gingerbread..can i upgrade it? Hi, maybe you mean to upgrade Samsung Galaxy Pocket from Gingerbread to Jellybean. Until now, there are no official release of Android Jelly Bean operating system for Samsung Galaxy Pocket. Hi, we answer using English. When you forgot the security protections answer at your Samsung Galaxy Pocket, then you can try to bypass or unlock using Google account or Gmail that you have already sign-in at this phone before. Please try to do several time wrong answer until the phone freeze for several seconds, then you will find Forgot Password button, press this button to bypass forgotten security code protection using Gmail account above. If you can not access Google account or Gmail account, then you should have to do hard reset with the hardware button option steps above. Hi, actually there are so many possibility happen when we flash our Samsung Galaxy Pocket with non official firmware. On this situation, you need to consider flash it back to official one. But if you need to test your Samsung Galaxy Pocket with other firmware or Android version, try to find the recommended one or which already recommended with many people in the community. Hi im using samsung galaxy pocket neo duos Gt 5312. It just happend that i cannot download apps from net but earlier it workd so what should i do to make it work? Hi, when you can not download any applications from Google Play Store, you need to make sure that your internet connection working properly, try to browse any site maybe yahoo.com from Galaxy Pocket Neo Duos GT-5312 using default Internet browser. If the connection fine but still can not download from Google Play Store, maybe something happen with cache data of Google Play Store. Please try to clean it up from Setting Menu > Applications, choose Play Store applications and clean the cache. Hi, you are doing the wrong update and you already flash manually your Samsung Galaxy Pocket with other firmware. The phone should not operate, so you need to try find the normal and run firmware for your Samsung Galaxy Pocket and follow the community step to reflash it again to your phone. Please ask help for someone who have experience to flash rom at Android, because some wrong step could make your Samsung Galaxy Pocket become corrupt and can not run anymore, so please becareful. Hi, if you also forgot for Google account username and password, maybe you can try to recover Google account or Gmail from computer browser, follow the step to recovery your forgotten Google account username and password. If you still can not access Google account, then you have to do hard reset for Samsung Galaxy Pocket with hardware button. But, after clean format, you need to create new Google account or Gmail, because previous account can not use anymore according forgotten password. I have samsung Galaxy DUOS pocket Neo GT-S5132. I accidentally sat on my mobile and my display is completely gone. before i hand it over to someone to discard or to fix, i want to erase all its memory, including messages, web history, FB logging data etc. Now I cannot see anything in the display, so is there anyway I can do this. Meantime I will try to follow the above mentioned solutions. Thank you. I am desperately waiting for a solution from you. Hi, there are some situations when our Samsung Galaxy Duos can not see anything from display. If you still can see the Samsung logo after booting or soft reset, than you still can erase anything with hardware button key reset. But if your display does not show anything or totally off although the phone already turning on, then maybe some problem happen with the LCD and we are afraid nothing can be do with this situations. Usually if you are not sure how the repair shop will do with our phone, we are recommended you to change all password at your online media, like FB, Gmail, and something like that. Hi , i have GT-S5302 duos it has a problem to display the sim no. it is showing sim 2 on both the sim on screen, because of this i m unable to recognize the calling sim. as every no is showing in the screen sim no. 2 .. pls help me to resolve the prob. Hi, we assume that you are not at flight mode state, please try to test both of your simcard card at other phone to make sure that simcard work normally. You also need to find out about some applications that has been install at your Samsung Galaxy Pocket Duos that might make the simcard not working or blocked, for some clue, try to uninstall every 3th party battery applications at this smartphone, maybe it can help. If the problem still happen at your phone, than you can try to do hard reset or master format, but please do backup first before performing master format, because all important data could removed or erase from your smartphone. Hi, to restore or unlock forgotten security lock pattern, we need to use Internet connection at our Android, because Samsung Galaxy Pocket need to make sure the username and password that typed correct. If you can not access with Internet, you can try to use other simcard provider which already Internet package available. Usually your phone factory setting already have local network APN provider. If still can not access Google account with Internet data, then you need to do hard reset or master format with hardware button. Hi, at this situations, you have to try doing hard reset with hardware button key like option #2 above. iam using gt-s5300 and i have try change android operating system . Hi, we are not sure you are using official Android update for Samsung Galaxy Pocket. If you are using custom ROM, then some of them are not work properly and can make our phone become work not normal. Hi, i have Samsung GT-S5302 duos it has a problem to vibrant not working . Hi, if your Samsung Galaxy Pocket can not vibrate, you should try to test your device using applications from Google Play Store. Or you can make sure the setup for your vibration is active. If you still can not activate the vibration after doing several test above, then you have to do hard reset or master format to make sure your hardware problem or not. If the vibration still can not work after doing hard reset, then the problem come from hardware and need to bring to service center to make sure. my samsung galaxy y duos lite is not responding. Its only restarting again and again. And samsung logo is not appear ther is only first screen shot i.e in topGT-S5302 and samsung in bottom. and its restarting again and again. the recovery option is not working. when i press volume up key + home button + power button its not appearing any recovery mode and when i press volume down key + home button + power button then a screen appears with warning and says ” a custom os can cause critical problems in your phone and installed applications. its happend when i was format my external sd card and removed it from my phone. I had used busy box and swipe also to increase the performance of my phone. and i rooted my phone also. please help me and tell me what happened with my phone. Hi, first we really not recommended we do root and install custom ROM at our Samsung Galaxy Y Duos. The standard tutorial or solution for fix this phone can not work anymore, because the literature to help in this page only work for non root and standard official operating system from Samsung. Please find the help or solutions from the community that you follow when doing root or flash with custom rom, usually the have some other solutions when their steps get problems. Hi, we need to find out more about this problem. Please try to use some free 3th party vibration test applications download from Google Play Store. If your phone still can not vibrate, then you should try to consider do hard reset. Please do not forget to backup all important data because hard reset will remove or wipe all important data at your Samsung Galaxy Y Duos Lite. After doing hard reset, you can try to test your vibration function again, weather use native applications like phone vibration or use the 3th party applications again from Google Play Store. If you phone still can not vibrate, then we suspect the vibration component inside your Samsung Galaxy Y Duos Lite is damage, this is also normally happen at some other smartphone and can be easily repair by replace the new vibrate component from nearest Samsung authorize service center. Hi, after you do hard reset but your phone Samsung Galaxy Pocket still get the same problem switch on and off by itself, then we are worry the problem come from your hardware. You should try make sure about your phone power button, some Android get problem because it use 3th party hard case that make the power button pressed, make sure you remove all accessories at your phone. Please also try to hard reset again, do not sign-in any account at your phone, then wait for about 1 hour too see your phone still get problem or not. Hi, you can try to download other 3th party camera applications from Google Play Store to test weather your default camera application have problem or not. You can Try Camera360 or something similar for camera applications, please remember to always download high rating and good review applications from Google Play Store, because there also many not good applications that can make our Samsung Galaxy Pocket functions become problem. If the camera still can not work with other 3th party camera applications, then you should try to do hard reset to make the camera and applications back to factory default. If the Camera still can not work after doing hard reset, then you have to bring your phone to Samsung authorize service center for further test. Hi. I am using samsung galaxy pocket neo GT-S5312. The only problem I am facing is that my phone always lags in between using apps whenever the mobile data is on although i have only few apps installed. Is there a way so that my phone can be boost up and can do multitasking easily because my sister is having samsung galaxy music duos and it works very fast. Hi, although this article talk about different phone, but we will try to help. Basically the specification of your Samsung Galaxy Pocket NEO GT-S5312 is enough for doing standard activity like email, chatting, browsing, listen to the music, social media like Facebook, Instagram and something like that. But we need to know, doing all standard activity still need some memory to load the applications, and the Samsung Galaxy Pocket only have 512MB RAM, therefore you will get some slow or lag time when access between each applications. While the phone need more RAM, then it will try to find one or more application to close by system to free the memory RAM, so it can running the last application that you choose. About your syster’s Samsung Galaxy Music Duos that run more smooth than your Samsung Galaxy Pocket, maybe the multitasking is not as many as your phone, the running application in the background is different. So you can try to do hard reset and use your phone again with standard application, hopefully it should run more faster than before. Hi, first we are always said that doing root or flash with custom rom will make your phone act not normal. The steps that you have done while doing custom rom will make your phone not standard again and not always available to flash again to default operating system. Please see the help steps at your previous community information to see weather they have the steps to make your Samsung Galaxy Pocket back to default OS or not. hi, i have a samsung galaxy pocket s5300 by trying to launch jelly bean i launch the wrong one now my phone doesn’t read any SD memory and neither my media working what can do? Hi, until today when we write this reply, Samsung has not been releasing Android Jelly Bean for Samsung Galaxy Pocket S5300 family. There are some unofficial Jelly Bean custom ROM which is not recommended to use for everyone, because the 3th party Jelly Bean operating system from many different community may have some bugs and can make the phone functions not fully work, this is maybe also happen to your phone after doing custom rom. The help for non standard firmware should by find with trial to use other updated 3th party custom rom from your previous community that you follow, maybe they have some update or solutions for your problems. Hello. My device is samsung gt-s5300 and i have rooted it, changed thebuild number and kernel version. I want to restore my device’s original firmware. Please help me.thanks. Hi, sorry to say but doing root or installed custom ROM will make your phone run not normal or some features at your Samsung Galaxy Pocket can not work. That’s why we are not recommended to do that. Because there are many way to root and installed custom rom, so we can not sure weather the standard steps to restore back your official Android operating system or firmware can work at your Samsung Galaxy Pocket. You can try to use Samsung Application for Computer PC known as KIES, download from Samsung official website. Prepare for USB cable and computer with Internet connection. After downlaod KIES software, you need to install it at your computer and follow the step to “Firmware Upgrade and Initialization”. If KIES ask for Serial Number (S/N), then you can see from the back side of your phone after remove the back cover and the battery. my galaxy pocket gt s5300 ,it has got like ashes when using the camera yet it has bin so nice at shooting photos .i don’t knw why bt others tells me that i take it to a technician and put another camera .wat should i do? ?help me please . Hi, you should make sure the camera problem at your Samsung Galaxy Pocket is software or hardware problems. First you can try to download other camera applications from Google Play Store like Camera360 or something similar like that. Then try to capture the camera using new installed applications. If your camera still can not work, then you should try to do hard reset or master format using #Option 1, because your phone still can access for Setting menu. If after hard reset, the camera still can not work, then you camera hardware might have problems, and it should bring to service center for further hardware test. hello! Our cellphone Samsung gt-s5303 is locked & I cant access to the any apps . I forget anti theft password . So please help me. Hi, you can try to unlock your Samsung Galaxy Pocket GT-S5303 using Google username and password that you have already signed-in at this phone before. Please make sure the Internet connection is active when you do bypass or unlock using Google account. If you can not access Google account at this phone, then you should do hard reset or master format with hardware button key above. I happened to log in my gmail account in my frend’s fon..now i want to know how to log out in the set GT S5312.pls help me by telling the steps to log out..
Hi, because Samsung Galaxy Pocket or Pocket Duos using Gingerbread, then you can not easily remove the Gmail account. You have two options, first you can change your Gmail password from computer browser, after that your friends phone can not access your Gmail account anymore. The second option you have to do hard reset at your friend Samsung Galaxy Pocket and then after master format finish, your friend should use other or new Gmail username and password. But doing hard reset will remove any important data and installed applications from Samsung Galaxy Pocket, so you should backup all important data before performing hard reset. i already uninstall some app, delete some files and when i look in my pc its 1gb free space but still notifying. pls help me..thanks in advance. Hi, you should make sure the internal memory card contain operating system storage and data storage partitions at your Samsung Galaxy Pocket, you see at PC or computer have 1 GB free space but that location at data partitions. Because computer by default can not read system partitions at your Android phone. However, the internal memory system storage can be full because of applications caches or temporary files. Please try to remove cache from Menu Setting > Applications, choose some applications that usually save more cache like Facebook or Twitter or Whatsapp or LINE or something like that, after choose the applications, you can Clear Data. Then see your internal memory will be get more free space. The other alternative that you can do is doing hard reset, so all cache will be removed and only factory default applications run in the beginning, but of course you have to backup all important data before doing hard reset. I have tried to hard reset my phone, and while rebooting the system, th samsung logo appeared and i thought It was successful, then it gone black I tried to push the power button and nothing happens, then I put out the battery and put it back again but it is not turning on.. what should I do? please help/.. The battery is not fully charged, do u think it is the problem? Hi, you can try to charge your Samsung Galaxy Pocket using different or other Android charger, Android charger minimum have 1A current output. This is just to make sure the battery fully charge. Basically although the battery is not full, but when your charger already working and connected to you Samsung Galaxy Pocket, then the phone should boot-up and run again. We are worry that something happen with your phone like already rooted or using custom ROM, then maybe some default hard reset could make it not work properly. sir i have a big problem regarding on my samsung galaxy pocket GT-S5300. i turned my phone into download mode without enabling the usb debugging. odin always FAILS i dont know what to do ive tried many solutions now but none of them worked! Hi, as far as we know, you does not need to make enable USB Debugging while going to download mode at your Samsung Galaxy Pocket. So if everything fine. After your phone at download mode then you can connect your Samsung Galaxy with Odin at your computer. But first of all before you go to download mode, just make sure your computer already have driver which can recognize your Samsung Galaxy phone. Otherwise, your ODIN can not connect to your phone after turn to Download Mode. Hi in my s5302 phone my memory card is not show but it show in my laptop.what should i do? Hi, it seems that your Samsung Galaxy Pocket can not read the file system type at your MicroSD card. Please try to format your microSD card from your Samsung Galaxy Pocket. Insert at memory card slot at your phone, then choose Menu Setting > Storage, Choose Erase or Format SD Card. Usually after format from your phone, then the external MicroSD memory card will be recognize by your phone with the right file system format. my samsung gt s5300 vibrates to every touch on screen. i want to stop it. how do i do?? Hi, maybe you mean the haptic feedback or vibrate response when you touch the 3 menu in the bottom of LCD screen at your Samsung Galaxy Pocket. Try to go to Menu Setting > Sound, disable the Vibrating Feedback or Vibrate on touch. If you vibrate come when typing the keyboard then please go to Menu Setting > Language & input > Keyboard and setup the menu for disable vibrate. If the vibrate problems come from others than both of it, then you may do hard reset, because some applications maybe make your Samsung Galaxy Pocket become vibrate when touch anywhere. Hi, this problem happen because you or someone else has already gave the security protection like screen lock pattern or password pin protection at your Samsung Galaxy Pocket. If you can not unlock it using Google account or backup pin, then please do hard reset with hardware button like steps at #Option 2 above. sir, i have formatt my phone (GT-S5302) sd card but now it is not shown on my laptop sir please tell me steps what i can do?? Hi, make sure you can read your microSD card from your Samsung Galaxy Pocket using file manager. When you connect this phone to computer PC, there are some options that show at your Samsung Galaxy Pocket LCD screen to mount the phone memory into your computer. Please press that button, after several time you computer will find your microSD card as new removable drive. At some computer, you need to connect the computer to Internet when it need to update the driver for Samsung Galaxy Pocket. Hi,my sam gt-s5300 always show mobile network not available whn I try 2 make a call .I did a hard reset bt still do the same,pls help me. Hi, please make sure your sim card already have Internet data subscription. If you are sure your simcard already have Internet data subscriptions, than you should make sure the APN already correct. Please consult with your network provider for more information about you Internet subscription and APN setting at your phone. Hi, some users also get similar problems when install Whatsapp from Google Play Store. Some of them also can not update the applications because not compatible issue. We thing this problem happen because Whatsapp do some minor update and it make your Samsung Galaxy Pocket can not install it again. Maybe you can try to find some old version Whatsapp that may compatible with your phone from some other community. Please find it carefully and make sure it comes from good review website. Hi, we really recommended Android user to use Internet Data package offer from your network provider, because if you use retail price for data connection, some provider will charge more expensive, but this is different for each country. However, some applications which are installed from Google Play Store will search for some update when the data connection available, with some setting it will download automatically when there are new update. Please try to use free wifi or personal wifi to download or update the latest one. Hi, it seems that the problem comes from your applications or software. Please try to do hard reset or reinstall the clean factory default operating system or firmware. After your phone finish doing hard reset, then you can try to test your battery again. Hi community? My samsung galaxy pocket s5300 is not recoGnizing after i finish the master reset method and i forget to back up it .pls help me what i should have to do i’m newbie.tnx…. Hi, have you ever perform root or install the custom rom at your Samsung Galaxy Pocket? Basically the file source of factory default Android operating system already saved safely inside your Sony Galaxy Pocket ROM. This files can not access with standard procedure, unless you done some root or custom rom installation. If you are not sure about what happen, then you need to ask help for checking your phone by bring to Samsung service center. Hi, sometime hard reset can not perform well, especially if your phone ever got some tweak with root or custom rom. However, what you can try is retry doing hard reset or master format using hardware button maybe it can solve the problem. If you still get the same problem, then you need to bring to Samsung service center for further help. Hi, please follow the steps at #Option 1 if you still can go to software menu. If your Samsung Galaxy Pocket Duos can not start-up or the operating system damage, then you can try to do hard reset using hardware button at steps at #Option 2 above. Hi, basically after doing hard reset or reformat your Samsung Galaxy Pocket, all functions should be work normally again, because most problems comes from the installed applications or operating system damage. Please try doing hard reset again one more time using software menu, please note, there is no different result between hard reset using hardware button or software menu. After finish doing hard reset, please try all your phone function like sound and vibration before sign in to Google account. If that functions still not active, then you should bring your Samsung Galaxy Pocket to Samsung authorize service center to check hardware problems. Hi! My samsung s5300 is not responding after i done master reset method, it open but its not responding even i click the android logo ,the emergency dial button and the change the language button,its not work. Please help me,im newbie… Thanks. Hi, we are assume that you already finish doing hard reset using software menu. If the phone is not responding, you should try to do hard reset using hardware button like steps at #Option 2 above. However, you said that you can go to emergency call button, means you Samsung Galaxy Pocket still can boot normally but can not response with some finger touch. Please try doing hard reset with hardware button, if the problem still happen, then probably your LCD get hardware problems and need to get further check to Samsung authorize service center. Hi, if you are sure your Samsung Galaxy Pocket software get problems, then please try to do hard reset or reinstall the operating system using hardware button combination steps at #Option 2 above. Hi,my phone kept saying not enough memory delete some items whenever i tried to open the gallery or play music and from file its not showing my photos and videos again though i did not delete them. I have tried times without number to delete some apps but still not working though it does work like that before. on the memory i have total space 1.81GB,available space 1.81GB, USB storage 2.20GB and available space 0.00B …..System storage 256mb….. pls help me as I have some important photos and files I ll like to still have so i cannot just format until i remove them. i hope the reply will appear in my mail so that i can know when the reply comes in. Thanks very much. Hi, as we know that Samsung Galaxy Pocket only have limitted internal memory to save all installed data and applications.But base from what you wrote that the free internal memory space is still 1.81GB available then we think the internal memory free size already fit to do anything from your phone, however we also does not understand which the available space 0.00MB that has already insufficient. You may try to delete some applications cache like Facebook, BBM, Twitter and something like that which can not more data to external memory. Go to Setting > Apps > Downloaded to find which big installed application then press Clear data button, by doing this you will reduce the internal memory usage space but you need to relogin again later to that applications. After clean some data, then try to see your total space again at your Samsung Galaxy Pocket. The other options if you need to copy images or data from your phone, please connect your Samsung Galaxy Pocket to computer using USB cable, then you would see your important data like photo and movie at DCIM folder. Hi, you can try to change the language from menu setting. If you can not understand about the current language then you can try to see the icon. The icon setting is usually like tools or gear. If you can go to menu setting, find icon with keyboard or font, then you can choose the new language at this menu. Hi, you can try to unlock forgotten security screen lock pattern by give several time wrong answer continuously until your phone freeze about 30 seconds. After that you will find Forgot Pattern button to press, after that you will need to give your Google Gmail username and password that you have already signed in before at this phone. Please make sure your Internet is active while do that steps. If you can not access Google account, than you have to do hard reset with hardware button combination key at #Option 2 above. My samsung gt-s5300 volume up is broken and i can’t do the hard reset buttons. What am i supposed to do?? My phone is locked and i can’t seem to open it. Hi, we strongly advice you to fix the broken hardware button. However, if you still can go to normal booting and can access the setting menu inside your phone, then you still can do hard reset with software menu Factory data reset. But your Samsung Galaxy Pocket problem with locked security still can try to unlock using Google account that you have already signed in before. Please try to give several time wrong answer continuously until your phone freeze about 30 seconds and you can find Forgot Password / Pattern button to unlock or bypass using Google account. my sumsung galaxy y dous lite have updated to jelly bean in last weak but i ignored to take a backup is implication my phone is not working. so what i do for the recover a my origanal android version 2.3.6 gb . Hi, unfortunately we are not recommended to do unofficial custom rom for your Samsung Galaxy phone because some wrong steps can make trouble. Because the steps is non standard depend on the community, then the answer can be vary. Please ask your previous community which you follow to upgrade using their custom rom, maybe they can give good solutions.